Ever wish you could make a rich, creamy dip that was also healthy? Consider it done. 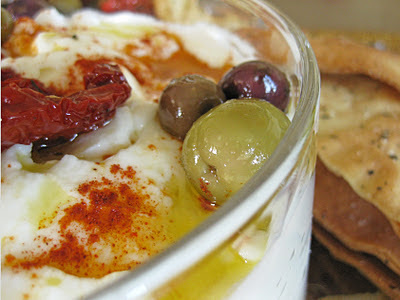 Labneh (also known as lebni or labni) is a homemade yogurt cheese. It's a common middle eastern food, and similar preparations can be found elsewhere including in Greece, Afghanistan, Uzbekistan, India and Pakistan. It's also a common Tajikistan food. After a friend of mine raved about this homemade cheese, I set out to make some myself! The story, and recipe lie ahead. 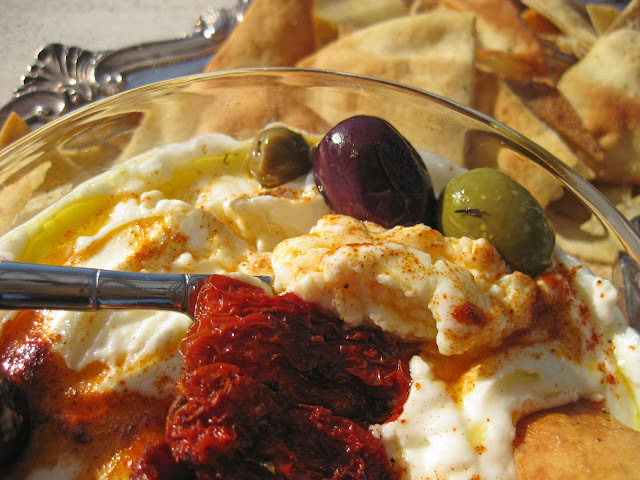 Labneh is very easy to make and delicious. Yogurt imparts the dominant flavors: tart, light, and fresh. Extra virgin olive oil poured on top adds a contrasting grassy, herbaceous note. My preferred mode of transit to mouth: a baked pita chip seasoned with salt, olive oil, and herbs. Yogurt cheese is just about the easiest homemade cheese you can make. Enjoy it as a middle eastern dip. Requiring little more than yogurt and salt, this healthy dip is easy to make: strain yogurt to remove the whey, resulting in a thicker yogurt. The longer you let it strain, the thicker it becomes. The result is a soft, fresh cheese that you can use in a variety of ways: packed in olive oil, as a dip, as a substitute for sour cream or cream cheese, served with honey à la greek yogurt, or used as an ingredient in sweet or savory dishes. Olive oil is an important condiment when serving labneh. One of the more traditional preparations is to roll the cheese into small, walnut-sized balls and then store them in extra virgin olive oil. I opted for another common (and much easier) route: put it in a bowl. Even when served as a dip, though, the cheese is given a dose of olive oil before being sprinkled with herbs (crushed mint, powdered sumac, za'atar, thyme and garlic are all common accompaniments, depending on your country of reference). Labneh recipes work by straining yogurt for several days until it thickens. Labneh cheese, when unseasoned, tastes similar to greek yogurt. 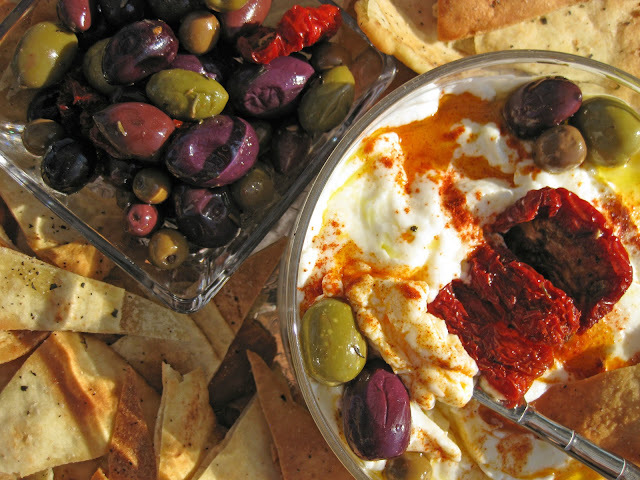 You can serve this middle eastern yogurt cheese with olive oil, pita chips, and olives. 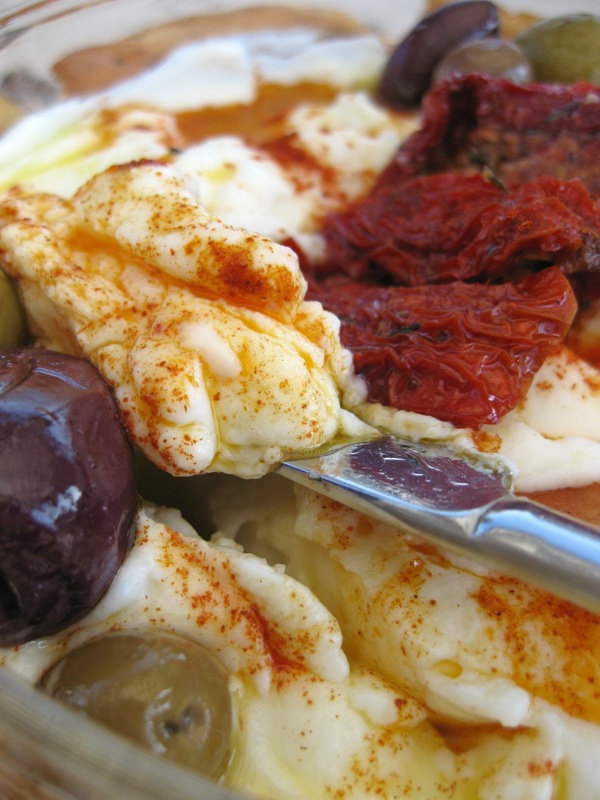 In the photos above, I've catalogued my approach to decorating the dip: garlic, herb, and oil-packed olives add some color in the top photo, paprika and olive oil top the dip in the second photo, and oil-packed sun dried tomatoes garnish the center of the dip in the bottom photo. 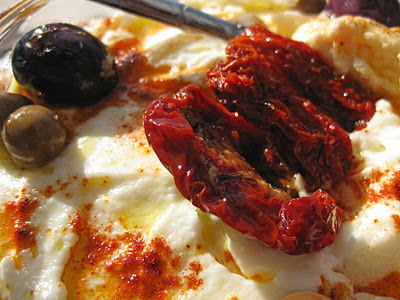 Not able to find za'tar to garnish the yogurt cheese, I had hoped to use powdered sumac - it has a beautiful red color and an acidic fruity tartness - but didn't have the time to track down a supply of that, either. Instead, I used paprika - the nearest thing in terms of color, and flavorful in its own right. Also, although I had wanted to use whole milk yogurt, the yogurt fairy brought me nonfat yogurt. I was sad to lose the delicious fatty richness of whole yogurt and was worried that I would end up with a runny mess, but it worked fine! So if you prefer a low-fat cheese, go with it. I strained the yogurt for three days to achieve the consistency seen above. 1) Line the sieve with a sterile cloth napkin, paper towel, or folded cheesecloth, and set the lined sieve in a bowl that will catch the whey as it drains. 2) Mix yogurt and salt thoroughly and pour into lined sieve. Gather edges of your sieve liner and secure them together with rubber band. 3) Let sit in fridge 24 to 72 hours depending on the consistency you prefer. If you're not sure how long this will take, open the sieve liner and check consistency at 24 hour intervals until it reaches the desired thickness. Labneh will keep for one to two weeks in the refrigerator. 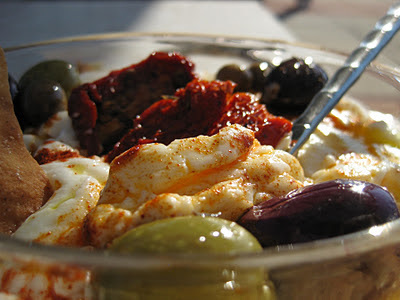 4) To serve as a dip, place in dish and top with olive oil. 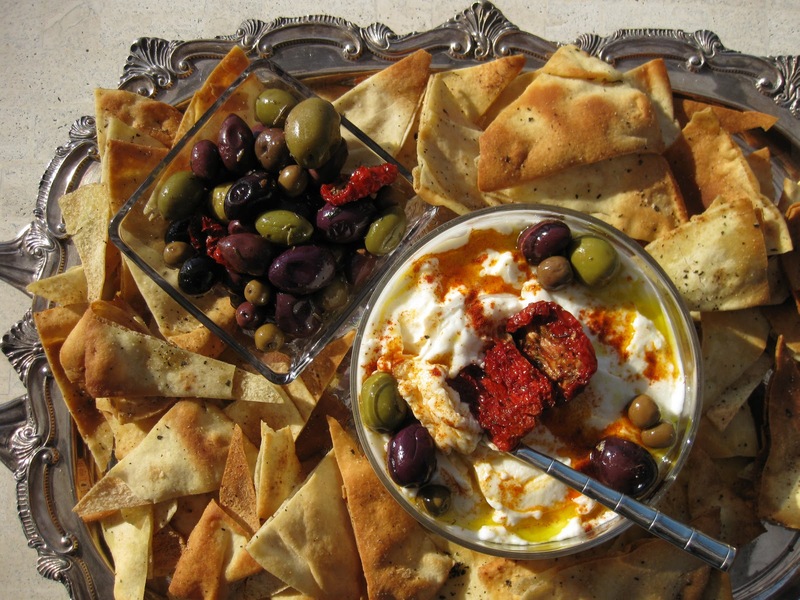 Sprinkle with paprika or za'atar and fresh herbs, serve with pita bread and olives. Note: If you can find a way to hang the sieve liner from a hook so that it is suspended above the bowl, you can ditch the sieve and the labneh will strain much faster. One suggestion is to place a wooden spoon handle across a tall container and hang the filled sieve liner from the handle using a rubber band. This labneh recipe makes a delicious yogurt dip and an easy homemade cheese. My friends loved the baked pita chip recipe, so I'll share that with you, too: Crispy Baked Pita Chip Recipe.